Check out this psychological suspense novel below and continue for a Q&A with the author! John Wright’s mind is playing tricks on him. He sees people he thinks he knows, but they are only strangers. His memory flickers in and out of focus. What he does know is this: he has not seen his fiancée, Iris, in over three years. He fled their Los Angeles apartment one night after a fit of rage that may or may not have left her dead. He has been living off a small fortune he stole from Iris’s rich, manipulative businessman father. He bides his time and waits for the police to find him and charge him with his lover’s murder. Has he killed her? Is she really dead? Talented, clever, sophisticated Iris was John’s anchor, the one joy in his troubled, lonely life. At Harvard, she transformed John from a shy and awkward undergraduate into an elegant, self-assured man. But now she’s gone, and his memories of her are obscured by a miasma of guilt and uncertainty. One bright day, Iris returns. But is she real, or just a cruel figment of his addled brain? Only a journey into the deepest corners of his past will reveal the truth about John and Iris–about life and death and love, and secrets too dark to reveal. 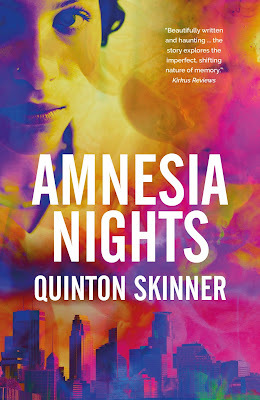 Quinton Skinneris the critically-acclaimed author of three novels and non-fiction books on fatherhood and rock ‘n’ roll. A former critic and magazine editor, he has written for publications including Minneapolis Star Tribune, Huffington Post, Variety, Glamour and Literary Hub. He lives in Minneapolis, USA. 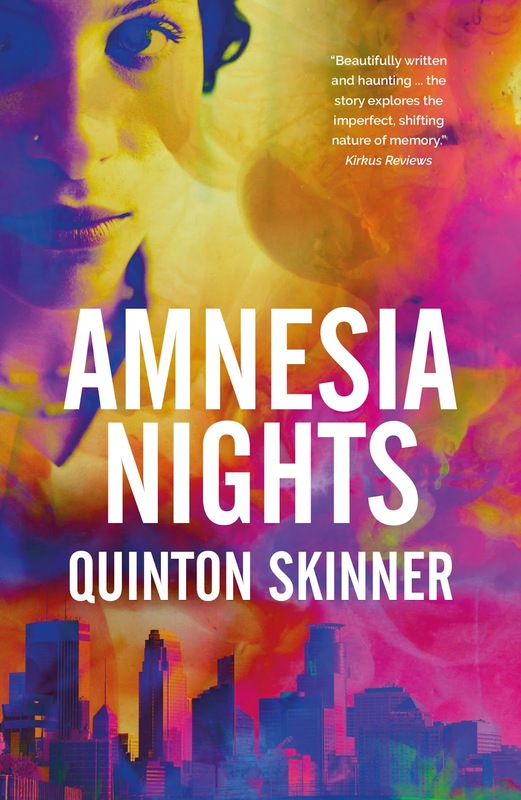 Did you write any books before Amnesia Nights? Yes, a somewhat odd aspect of my life is that I have almost continuously been writing books (with some dormant periods), beginning with bound tales of my international adventures and explorations of Clark Kent’s secret life when I was 5. So why have you published only (more or less) three works of fiction? An astute question. Well, I was fortunate enough to have had an apprenticeship as a ghostwriter and book doctor in my twenties that served the twofold purpose of paying my bills and allowing me to write without my ego on the line. To each their own. There were great adventures to be had there that I wouldn’t replace. Amnesia Nights has a supernatural undertow. Is that something you draw upon from real life? Absolutely. I have had a number of undeniably paranormal experiences in my life, some of which occurred while I was writing the book, some of which have happened since. This isn’t a point of pride or a way of telling stories over a beer, it’s just true. Things have happened around me that make no sense in the conventional consensus view of reality. And I do have a sense when something is peering in from a strange angle. The book also has a very pointed emphasis on memory. Beginning with the title. For reasons that have only become apparent after a great deal of self-examination, memory is the underlying theme of my work. Even when I don’t intend it, as with my latest project, it becomes central. It’s crucial to who I seem to be. I know why that is. But it’s terribly personal and has to do with my early childhood. A few years ago I wouldn’t have, or I wouldn’t have been able to. The bottom line is that I was raised primarily by a single mother who loved me very much, and who was also quite profoundly mentally ill. This resulted in what is technically called an “attachment injury” in psychoanalysis. It’s been both the weighty stone that I’ve carried my entire life and, paradoxically, probably led to my deep and abiding gift for devising and telling stories. So the good and the bad go hand in hand? So, ultimately, how much of John Wright is Quinton Skinner? The parts you wouldn’t think. Some of the best parts, I hope. He isn’t remotely an autobiographical character. But he remains very real and alive to me. I conjured him, but he is also real on his own terms. There is a psychological theory of “parts” that has nothing to do with “split personalities” but rather self-protective dynamics springing from childhood, and I think it’s a relevant issue when I consider the relationship between John and myself. That being said, my mother was still alive to read an early version of the book, and she said it was beautiful and didn’t seem to notice any of these parallels. Which is for the best, I suppose, since I’ve been reconciling myself with her memory throughout my literary career—only really leaving the nest, as it were, with my latest, which is a sci-fi dystopian love story that touches on the nature of reality and identity and . . . memory.